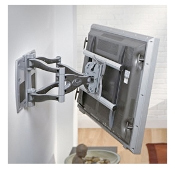 (PERFECT FOR INSTALLS THAT WONT ALLOW CONCEALING OF CABLES LIKE A FIREPLACE MOUNT). Contact customer to coordinate time of arrival on prescheduled appointment, if noted on the work order. Utilize a two-man crew to install the Flat Panel TV. Secure included mounting bracket to standard frame or masonry wall, or assemble optional support stand. Mount and secure Flat Panel TV. Connect system to pre-existing AC power-supply, using neat wire management. Attach cables from tuner source or E-Box (up to 12 feet), by neatly routing exposed wires to Flat Panel TV. No wires hidden within walls, or any type of custom in wall wiring is included. Integrate Plasma display to an existing home theater or audio system located in same room, and program new Universal style remote(s). If the customer provides upgraded wire or accessories, use them. Ensure that all wires and cables are neatly dressed using wire ties. Clean up wire clippings, drywall dust or any other debris caused by the installation. Demonstrate features and train on basic system operation. Review completed installation and obtain written customer satisfaction check-off. At completion of installation, remove Flat Panel TV box and packing materials from home to customers recycle bin. Before discarding, check to be sure that all included manuals were removed from packing. Sign and date the customers receipt. With years of experience and our ideas your flat panel televison can be mounted on your standard framed wall and working in a matter of just hours when the installers arrive. Plus your covered for a full one year warranty on the install.